Barbara Gassaway and Mira Davis-Kelly attended the Leaders + Legends Speaker Series on Monday at the Johns Hopkins Carey Business School in Baltimore. 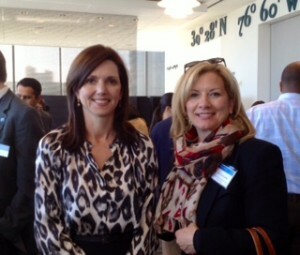 The event featured Beth Comstock, who is the Senior Vice President and Chief Marketing Officer of General Electric. One of the focuses during this presentation was how to foster innovation and change. Innovation plays an essential role in staying on top in the many industries GE provides products for, yet how does a company so big stay nimble? Two methods that stuck out to Barbara and Mira were employing the help of startups and encouraging the use of open source work. GE provides incubators to startups, which can provide the ground work for some game-changing ideas. The other method, open sourcing, gives individuals inside and outside the company the opportunity to solve challenges they are passionate about. For example, GE may present the problem that they need to make a certain piping material 80% lighter. A student, who is unaffiliated with GE but passionate about the topic, can take on the challenge and work the project to find the solution. Both of these methods encourage innovation by providing the means and support for a small number of people to provide a big idea. Thanks to the Carey Business School for a great seminar! We look forward to the next one. This entry was posted on Wednesday, April 23rd, 2014 at 5:48 pm. Both comments and pings are currently closed.